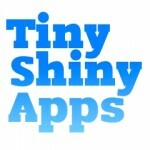 It was pleasant surprise today to see that apps I have written as TinyShinyApps have been downloaded 30,000 times. PictoBento was done as a showcase app and shows beautiful images from Instagram and Dribbble. It was written in iOS4 and is ripe for makeover to take advantage of new views introduced in iOS5 and iOS6 and that will probably not happen until iOS7 lands. TV Soap Quiz was an experiment with template apps and iAds and AdMob. Even with 15K downloads, the ad revenue is minimal. Although it has easily covered the cost of the template project and additional content costs. Regular updates would help increase revenue and building up a regular release of questions could prove worthwhile. Surely with a few tweaks, these apps can hit 100K downloads. Two of the greatest intros of all time, ever. as heard in Soul Boy. as heard on Black Mirror 15 Million Merits. Surround yourself with people who ship good work. Never let the perfect be the enemy of the good. Or, otherwise put, make it work, then make it shine. Know your tools inside and out. Read the documentation. Write documentation for your own work. Don’t couple your code to your specific use cases, but don’t generalize it too early, either. Complex, successful things are made of lots and lots of simple things. This interview was part of the campaign for App Camp for Girls. Very surprised to find that Facebook acquired Parse back in April 2013. Parse has been my on radar as a potential solution but this would add concerns about the platforms longevity. Like? Except it remains the only open, barrier free method of communicating between services without any restrictions or partnership agreements being in place. Every service uses email as a fallback method of sharing but it deserves a much higher status than that. As always, excited about the next Woody Allen film being on the way. I’m now a shareholder, so my next drinking session will also be an investment meeting! This is the third equity offering for the punk Scottish brewery. I missed out on the first offering without even realising so snapped up the chance with this one. Looking forward to the 2014 AGM party already. Tempted? Pics and videos, oh and financial stuff. Coming from a background in test automation I was pleased to see that there was a suitable solution for iOS. Telerik’s iOS Test Studio is an iOS app for simple test automation. I’ve previously tried it our for web testing and had been very impressed with its capabilities. Especially the freedom it allows by giving you the power to record and execute automated testing from your mobile device. Today was the first time, I’d tried to run it against an iOS application. The Xcode configuration needs are well documented and simple to set up. Recording a test is very simple, including adding verification steps. It hit a limit for me as I need to check that the email launched contains the correct content but iOS Test Studio app won’t recognise the mail client. I’ll be contacting Telerik to find out if this is possible. Test playback is only one test at a time which is unfortunate, but a test list feature is being discussed for this year. Hooking up the iOS Test Studio app to the web portal means that all tests and results can be viewed remotely. This free’s up test data from the device. This does unfortunately require a manual sync within the app. iOS Test Studio is free for both the app and the web portal.